In Sykes v Cleary in 1992, the High Court sitting as the Court of Disputed Returns found that section 44i of the Constitution disqualified two foreign born dual citizens who were candidates at a byelection. One was from Greece and the other from Switzerland. Both candidates did not realise that they were still citizens of another country as they believed that when they gained Australian citizenship their other citizenship ceased. It was decided that these candidates did not take all reasonable steps to renounce their foreign citizenships and were therefore disqualified. Then in 1999 in Sue v Hill a Senator was found to have been disqualified because she had retained her UK citizenship. The High Court sitting as the Court of Disputed Returns determined that the United Kingdom was a foreign power. These days we might scratch our heads and say of course the UK is a foreign power. But until the Australia Act was passed by all the Parliaments in Australia and in the UK in 1986, we still had substantial enough links for the UK not to be classified as a foreign power to Australia. Before 1986, some cases in the State Courts could still be appealed to the Privy Council in the UK. A previous case or legal decision that may be or (binding precedent) must be followed in subsequent similar cases. As such these previous High Court decisions were referred to and challenged in the current case. For these parliamentarians to survive in the roles, they needed to differentiate their circumstance from the candidates in 1992 and the Senator in 1999, or ask the High Court to disregard or change the old precedent. The Attorney-General was represented in the Court by the Solicitor-General Stephen Donaghue QC, who was first to present his argument on Tuesday morning. The Government argument is that only persons who have voluntarily obtained or retained foreign citizenship should be disqualified from sitting in the Parliament. A person who did not know that they were a citizen of another country could not have voluntarily obtained that status. In the past, the Court has found that a person who has foreign citizenship needs to take all reasonable steps to renounce that citizenship before nominations close for an election. But, the Government argued that if you don’t know you are a citizen, you cannot take steps and so taking no steps is reasonable. Subsequently the Government claimed that five of the seven parliamentarians should not be disqualified. 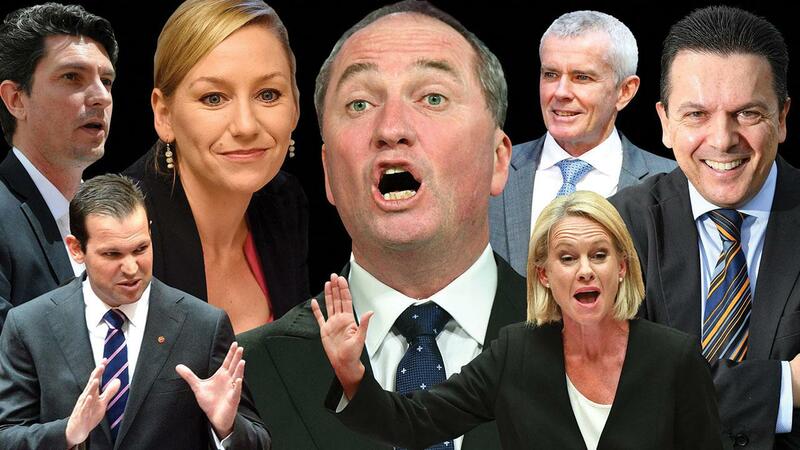 They are Barnaby Joyce, Matt Canavan and Fiona Nash from the Nationals, Larissa Waters from the Greens and Nick Xenophon. It was argued that One Nation’s Malcolm Roberts and Scott Ludlam from the Greens should have reasonably known that they had foreign citizenship since they were born overseas and both applied for Australian citizenship in their late teens. As such, only these two should be disqualified. Has been around since 1992 and some people would have arranged their affairs accordingly. The two major parties have stated that their MPs and Senators check their foreign citizenship by descent statuses before they nominate. They arrange their affairs according to the current reading of section 44i. There was quite a bit of discussion back and forth on this point. Next up after lunch on Tuesday was Bret Walker SC who was representing these two National Party Ministers (this in itself is interesting as Walker is representing a Labor candidate in a section 44v case against National MP David Gillespie). As we know both Nash and Joyce were foreign citizens by descent at the time of the 2016 election. The crux of the argument was that these two Nationals were in a different situation to the candidates in Sykes v Cleary as they were natural-born Australian citizens who had no awareness that they were citizens of another country. And as soon as they found out they took steps, nearly immediately, to renounce their foreign citizenship. Therefore they should not be disqualified. The nuanced argument is that in Sykes v Cleary the Court did not answer a question that might have covered whether knowledge of foreign citizenship had an effect on the disqualification in 1992. As such, Walker argued that the Joyce and Nash situation is indeed different from Sykes v Cleary and they should not be disqualified. Matt Canavan was represented in the Court by David Bennett QC, who is a former Commonwealth Solicitor-General. The arguments were heard late on Tuesday and first thing on Wednesday. He started by reminding the Court that Matt Canavan was an Australian citizen from his birth in Queensland in 1980. It was asserted by Bennett that Canavan became an Italian citizen by descent at the age of two, when the Italian law was changed to reflect a decision of the Constitutional Court in Italy. However, he argued the way the citizenship was given to Canavan, retrospectively, and without his consent or knowledge, may have violated the Italian Constitution and should therefore not be recognised by Australian law. Bennett also argued that when Matt Canavan’s mum filled out her application to become an Italian citizen in 2006, the Italian consulate made a mistake when they conferred citizenship to Matt. In any case, once he found out that he might be an Italian citizen he immediately took steps to renounce it. To sum up his argument, Bennett stated that if the Australian Court was to recognise complex citizenship law from other countries then people who are up for a genealogical witch hunt would occupy the Court after each election. He stated that such inquiries are totally inappropriate in a nation of immigrants, where up to 41% of Australians are potentially dual citizens. Nick Xenophon was one of the last of the seven to find out that he was a dual citizen. However, his British citizenship is of a class known as British Overseas Citizen (BOC). This type of citizenship does not give Nick Xenophon a right of entry or abode in the UK. He was represented in the Court by Andrew Tokley SC who argued that when a slender connection exists between a foreign state and an individual, it should not be recognised. It was asserted that a BOC does not fall within the meaning of the words that the person is a subject or citizen entitled to the rights and privileges of a subject or citizen of a foreign power. When asked by Justice Keane whether this meant that a British overseas citizen is not a citizen of a foreign power, Tokley replied yes. The differentiation made between Nick Xenophon and the two candidates in Sykes v Cleary was that both of the candidates in 1992 had the right to enter and live in a foreign country. It was also argued that foreign law should not be determinative of section 44 of the Australian Constitution. To back this up, it was stated that the European Union does not recognise this class of British Citizenship. Both of the Greens were represented in the Court by Brian Walters QC. It was asserted that Waters and Ludlam conceded that at the time they nominated for the 2016 election they were citizens of a foreign power and were consequently disqualified. Once they learned of their dual citizenships they immediately resigned to comply with their duty to the Parliament and the Constitution. It was argued that a belief that one is not a citizen of another country does not absolve a person from compliance with section 44 of the Constitution. Walters stated that Sykes v Cleary was correct. There are two common ways citizenship is obtained, through place of birth and by descent, and anyone who is potentially a foreign citizen by one of these two methods must take all reasonable steps to inquire about possible foreign citizenship and then renounce it. The Justices asked Walters whether Sykes v Cleary, which was about the status of two foreign-born dual Australian citizens, should be extended to cover natural-born Australian citizens. He replied that there is no reason in principle for the Australian born dual citizens to be treated any differently. There was a lot of discussion back and forth between Walters and the bench, which did receive some critical media reporting. Some media stated that this discussion meant that the Greens position had been rejected by the Justices. However, we should be a bit careful about jumping to conclusions, as the Justices may have just wanted to further clarify the Greens position. Tony Windsor was a candidate against Barnaby Joyce in the seat of New England at the last election. He was represented in the Court by the most recent former Solicitor-General Justin Gleeson SC. He argued that in Sykes v Cleary the reasoning for the decision was in terms of a general principle which was applicable to all persons who were foreign citizens by any means. Gleeson stated that section 44i requires Courts to determine whether a person is a foreign citizen by the laws of a foreign power. If that person is not a foreign citizen that is the end of the matter, but if they are, then that person should be disqualified. He also argued that the foreign laws that confer citizenship should be recognised because of our respect for international law. In the case of Italian law (which was earlier brought up), citizenship by descent can go back for seven generations. Some seventh generation dual Italian Australians who learn of their Italian citizenship may quite like it and take benefit of it. Gleeson argued that a parliamentarian in the same position must make a choice and renounce their Italian citizenship. Otherwise we could be setting up problem whereby a parliamentarian with seventh generation Italian citizenship could say this law is exorbitant, while ordinary Australians could still use the law. Gleeson argued that the rule is straightforward and simple. If you seek election to the Commonwealth Parliament you must renounce your foreign citizenship. The only exception to this rule is if the foreign country does not allow a person to renounce their citizenship or places an unacceptable burden on a person before they can renounce. He also submitted that this argument is not an extension of Sykes v Cleary, but the essence of it. The mere existence of foreign citizenship creates the potential of a divided loyalty to Australia. It is not a “reasonable steps requirement”. It is an “all steps reasonably required” requirement. It was then asserted that in Sykes v Cleary the two candidates who were disqualified did not take all reasonable steps, the first of which included checking for foreign citizenship. Latin for ‘friend of the court’. An amicus curiae applies to the court for leave to be heard during a proceeding. Unlike interveners, an amicus curiae does not become party to the proceedings. Rather, the role is to offer a perspective that the court thinks is important for resolving the dispute that are unlikely to be fully or adequately raised by the immediate parties to the dispute. The friend of the Court, the Amicus curiae presented an argument that Matt Canavan, Fiona Nash and Nick Xenophon should be disqualified. It was argued that each of these Senators had the status of citizenship according to the laws of a foreign power and for an Australian court not to recognise this should not be taken lightly. Section 44i is concerned with the status of citizenship and should not be confined to only those that voluntarily acquired or retained that foreign citizenship. The argument went further. Even if section 44i was confined to citizenship that was voluntary, each of the Senators should still be disqualified as at the relevant time they did indeed have knowledge of their circumstances. This is one point that has been brought up for constitutional experts. Even if you don’t know you’re a dual citizen at the election, once you do find out, you should be disqualified. The Government earlier countered this line of reasoning in their argument, by stating that once a parliamentarian finds out they are a dual citizen, if they renounce within a reasonable time frame, they should not be disqualified. What is a reasonable time frame and who gets to decide is unknown. The Justices questioned Geoffrey Kennett about whether Nick Xenophon’s status as a British Overseas Citizen was the same as a citizen. He replied that the court should decide whether his status amounted to that of a British citizen by determining whether British Overseas Citizenship required loyalty from Xenophon and offered protection in return. Loyalty in not a nostalgic feeling, but a legal term. Loyalty to a country means that you may have duties to perform for that country. For instance, in some countries every person must serve for a period of time in the armed forces. As for protections, would the UK offer Xenophon the same protections as other British citizens? The UK citizens being held in Guantanamo Bay were all taken out of that place by their Government. Would they have left any British Overseas Citizens behind? Or would they have fought to get them out too? Malcolm Roberts was represented in the Court by Robert Newlinds SC, who argued that it is un-Australian to discriminate against him because he was born overseas. As we know Roberts was a British citizen until at least December 2016. However, Roberts argues that he also did not know that he was a British citizen and so should be in the same category as the five that the Government are arguing should remain in Parliament. He says that in fact, his situation is better, because he at least attempted to check his citizenship status with the British before nominations for the 2016 election closed. It was argued that even though he fired off emails to defunct addresses it does not matter, he did try to find out. it is not always possible to do so immediately. We will have to wait. For the Government there is a lot riding on this decision, but the Court is independent and separate from the Government and must take the time that is necessary to consider the three days of arguments before it hands down its decision.